Editor's note: DePaul graduate journalism student Monica Carter has been participating in Derby Lite, a fitness program that has fed some players to the Windy City Rollers flat-track roller derby league. This is a first-person account of her experience so far. Roller derby is something I always wanted to do. I have friends who I’ve known for years that skate competitively. I would see them gear up, compete, and I always admired them for it. I find my friends more confident and tougher than I am, so seeing them in derby wasn’t surprising. Secretly, a part of me always wanted to skate and be like them, but I held myself back because I didn’t think I had it in me. In the winter of 2013, I did a project on the women of roller derby for a graduate photojournalism class here at DePaul. 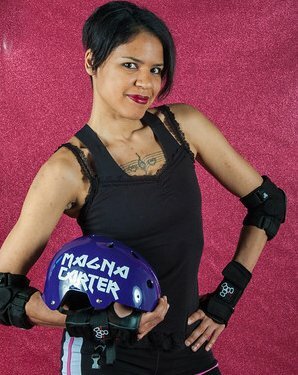 One of the women I interviewed is a skater for the Windy City Rollers. She told me about a fitness program called Derby Lite. She explained that Derby Lite was how she started and that that I didn’t need prior skating skills or to be a lifelong athlete to participate. I was so excited after talking to her about it, so I signed up for classes that night. Derby Lite is a roller skating fitness class where the curriculum is based on the techniques used in competitive women's flat track roller derby. Many women that start developing derby skills at Derby Lite eventually try out and make teams. I view Derby Lite as a training ground. My goal is to eventually make it through all the levels and eventually try out for a team. While I was extremely excited to start my first class, I caught a momentary wave of fear that I couldn’t do it. I thought I was too “old” to start roller derby. I’m 37, and while I’ve taken good care of my health and my body, I’m definitely not as resilient as a 22-year-old athlete. The thought of taking on such a physical sport at this point in my life seemed crazy, but I knew I just had to try. My fears were subsided when I walked into the gymnasium and began talking to other skaters. Some were my age and almost everyone was a first timer. Some told me they hadn’t been on roller skates in decades. I felt relieved that most everyone was at the same level as me. At the end of the floor exercise, you get up as fast as you can and do it all over again in the other direction. This goes on for 10 minutes or longer. The first time I did it, it was the most grueling exercise I had ever done. But I absolutely loved it. I was drenched in sweat and I could feel my muscles shake, but I felt invincible. I knew I was going to be sore after that workout, but the next day when I woke up I had a sharp pain in my back. It hurt to breathe. I couldn’t sneeze or yawn, the squeezing pain around my left lung was so intense. I went to my chiropractor that afternoon and found out that through the intensity of the exercise I had done the day before, I displaced three ribs in the middle of my back. For me, this was a rite of passage. I had pain because I pushed myself to the extreme. I wasn’t scared or upset, I was proud of myself. My chiropractor popped my ribs back in place and four days later I was back on my skates. I’ve made some great friendships through Derby Lite and I’ve only just started. Never have I been involved in a sport that can draw people close together so quickly. We all cheer for each other and encourage each other. It’s heartwarming. No matter how bad of a week I’m having, I know that once I get to class I’ll be surrounded by a strong support system. Last week during practice, we worked on a drill that required each skater to weave in and out of a pace line. Once at the front of the line, each skater was to skate as fast as she could around the gymnasium. When it was my turn, I broke from the front and heard all my fellow D’Liters cheering for me. At that moment someone yelled out “Yeah Monica, you can do it!” I felt my eyes tear up as I sprinted around the gymnasium. It was an overwhelming feeling of confidence and support and it was fantastic.